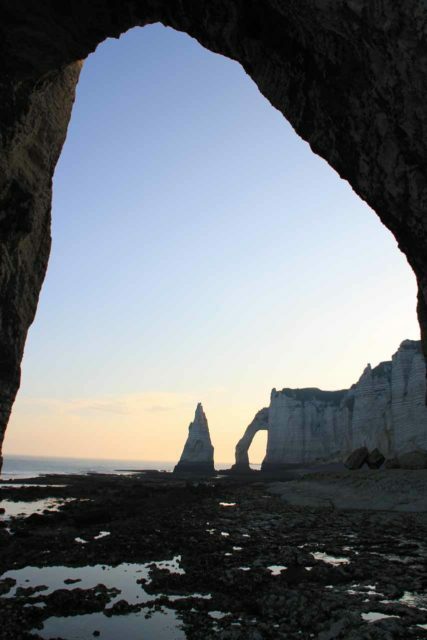 The waterfall at Etretat (Étretat [EHTR-uh-tah]) was my excuse to include the impressive sea arches that the town is known for. 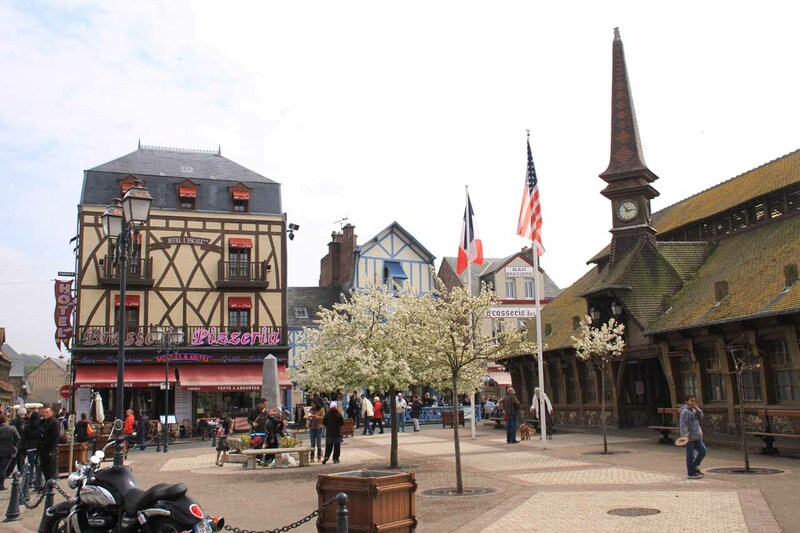 The town sits within the Seine-Maritime department of the Upper Normandy (Haute-Normandie) region of Northern France. 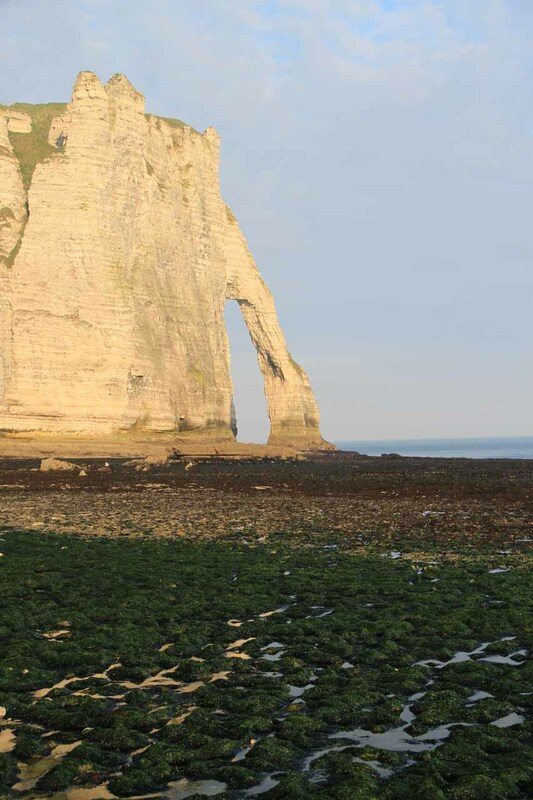 The waterfall itself is probably a mere 10m or so, but an excursion to reach it rewards you with an exhilirating close-up look at two of Etretat’s three sea arches – Falaise d’Aval and Manneporte. 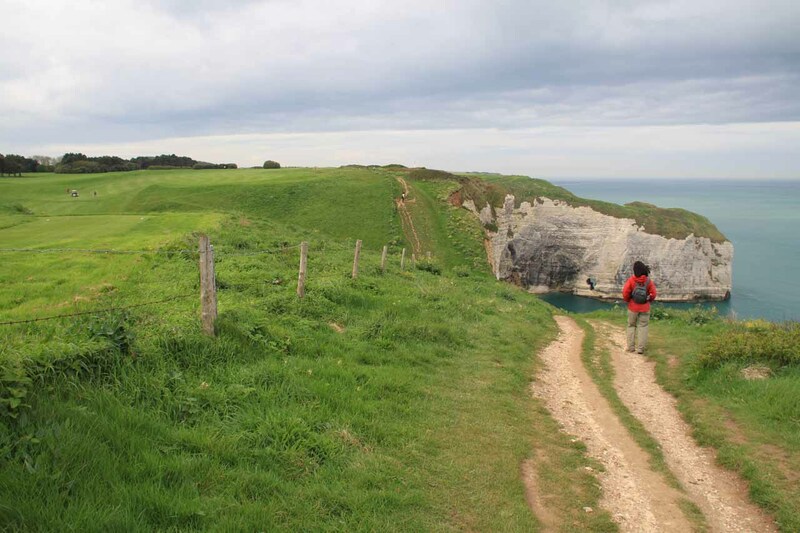 You can also get distant views of the third and smallest arch called Falaise d’Amont from a trail starting from the northeast side of town. 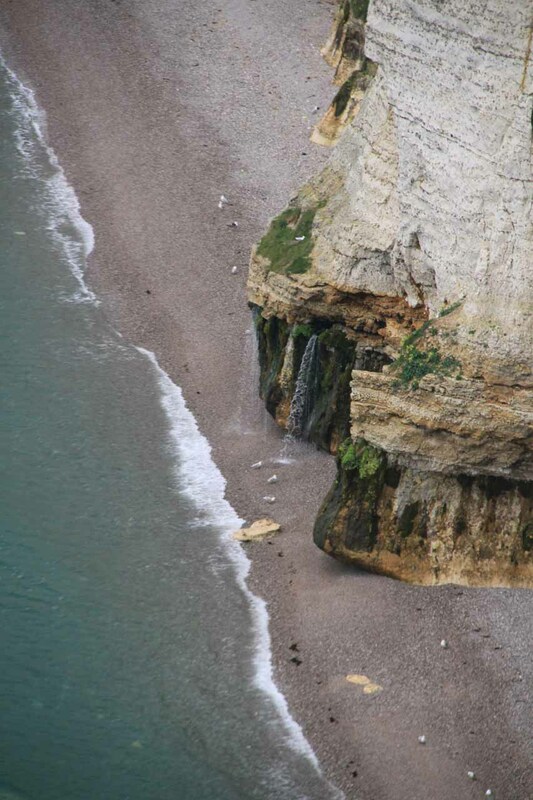 It appears that the falls emerges from the base of the sea cliffs facing the English Channel. 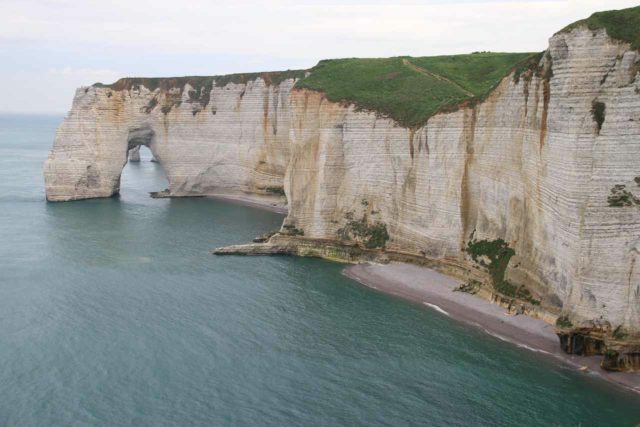 It is probably a result of gullies and rain catchments finding an aquifer or seepage holes within the sea cliffs themselves before emerging as a spring near its base. 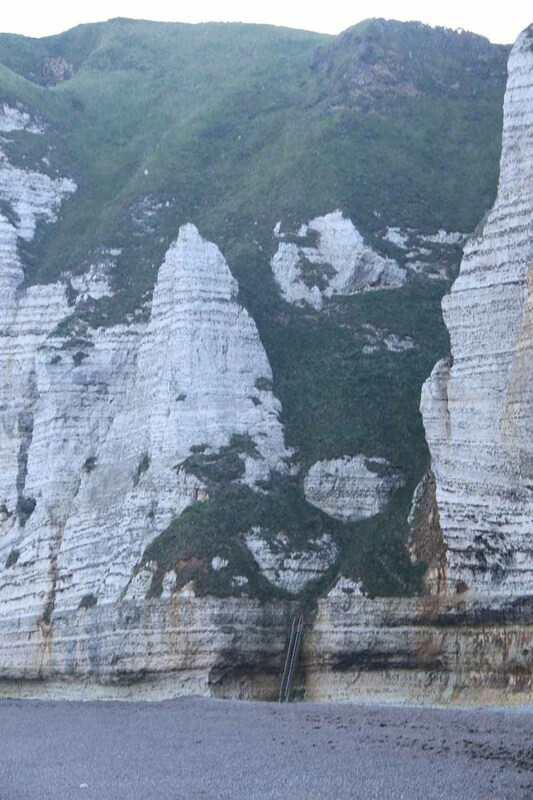 I’m not sure whether this waterfall flows year round or not. 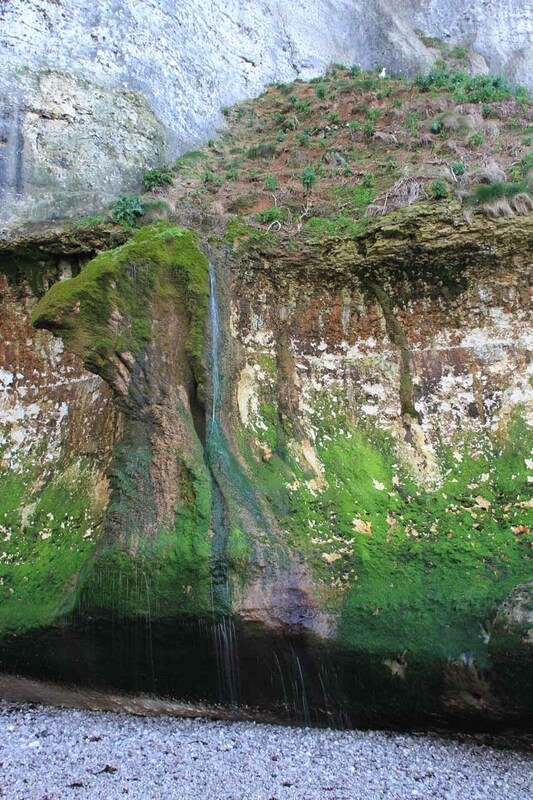 In order to reach this waterfall, there were a couple of things I needed to know first before heading out. First and foremost was that I had to respect the tides and only attempt it at low tide to avoid getting trapped by the water. 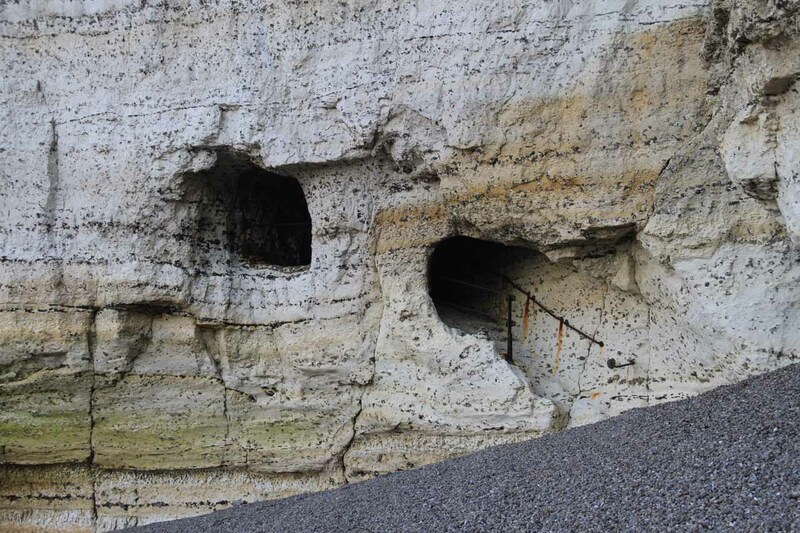 Second, I had to be aware of the hazards due to some mild drop-off exposure, slippery surfaces, and falling rocks from sea cliff erosion. To deal with the tide situation, I needed to know the tide table for the day that I planned on doing this excursion. 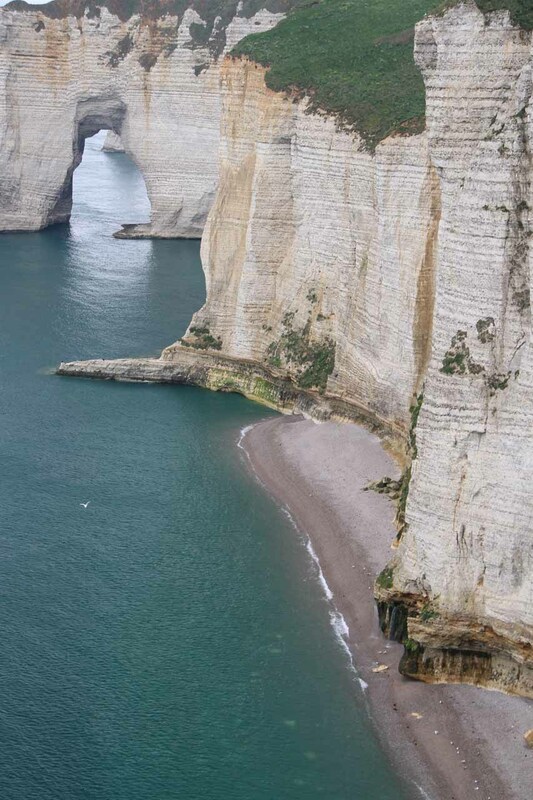 The visitor center in the town of Etretat gave me a small surf pamphlet (in French, though it wasn’t hard to figure out), but there were also signs where the walkway descended towards the pebble beach providing this information as well. I gave myself at least two hours on before the reported low time on the pamphlet, and mentally I had until two hours after low tide to wrap up the hike (and avoid getting trapped by the rising waters). I definitely didn’t want to underestimate how quickly the water rises when high tide approaches, which is why timing is everything in this bit of an adventure. As for the hazards, I did the hike in hiking boots because I knew I would encounter slippery algae-covered rocks that needed to be traversed to proceed. 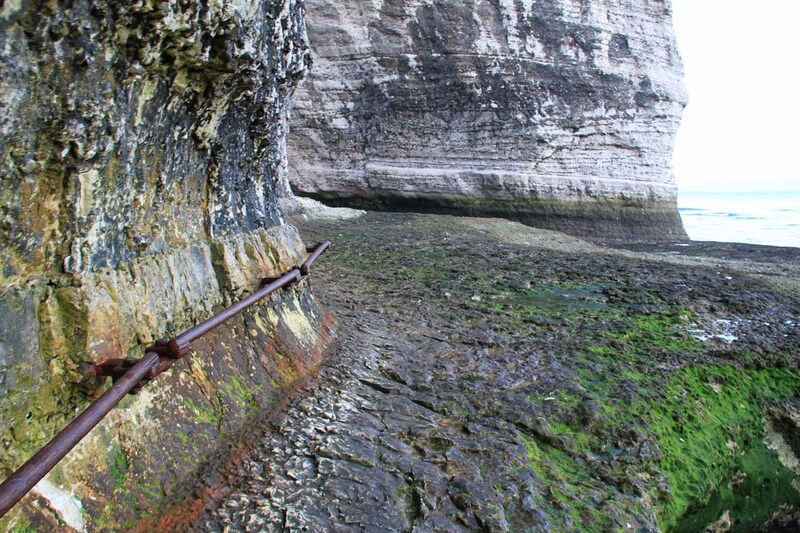 There were also sections where I had to climb on rusted metal ladders or hold onto handrails with some exposure to dropoffs. Although I didn’t bring them on my visit, I definitely could’ve used climbing gloves, which should have improved the grip and protect my hands a bit more. 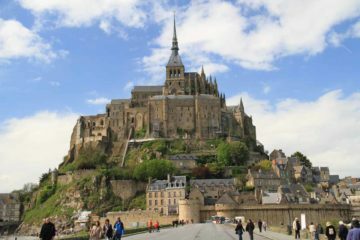 Assuming that you know and understand the wild nature of this excursion and its risks, here’s a breakdown of how I did the adventure. 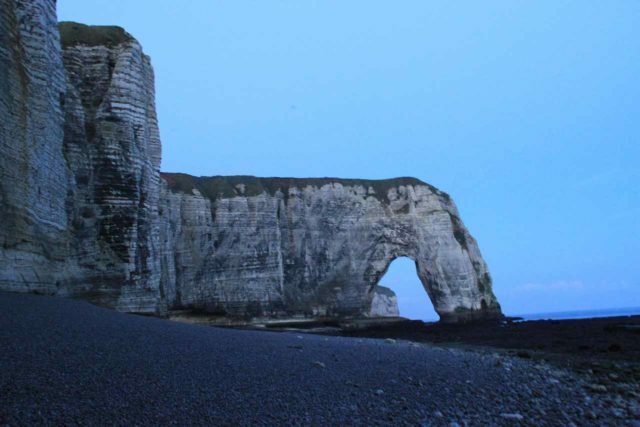 I started the hike before sunrise (around 5am) because low tide was at 7:16am. 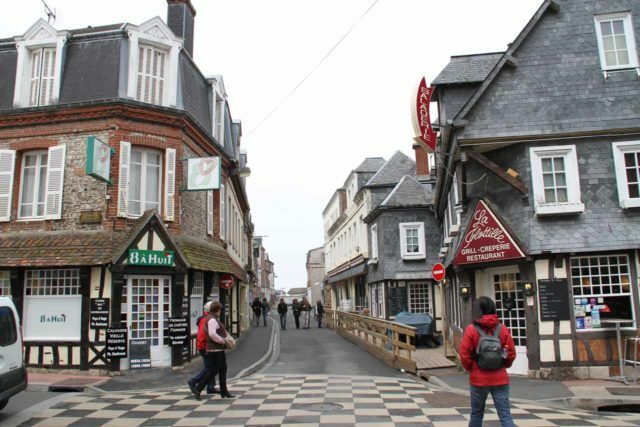 Since we stayed in Etretat, this was my starting point (though I’d imagine visitors not staying in town would also have to find parking and start from town). 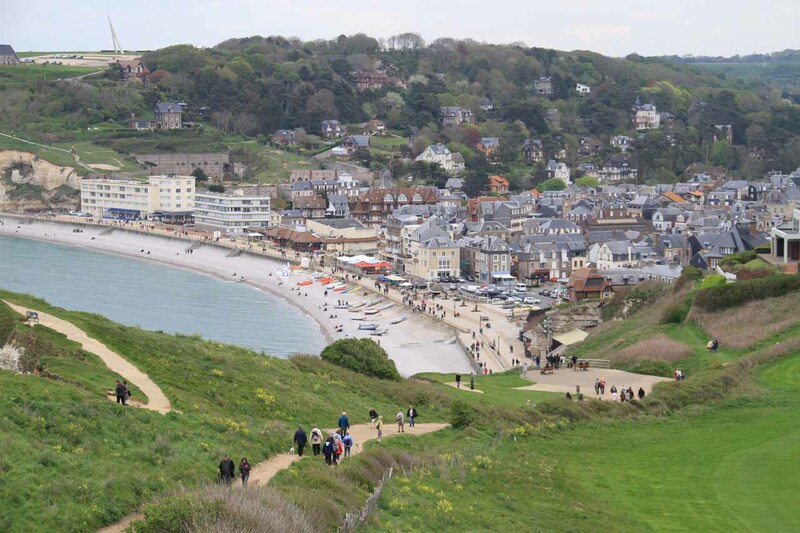 It was only a few minutes from town center to the pebble beach facing the English Channel. 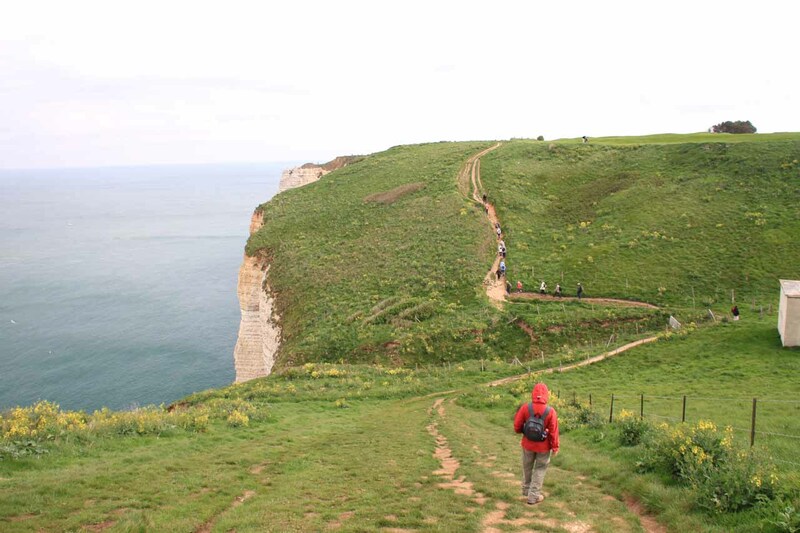 It was at the pebble beach where I saw in one direction (east) the Falaise d’Amont and a chapel high up on the cliffs (there was a separate trail that would’ve let me get closer to it as well as a road that also led up there). 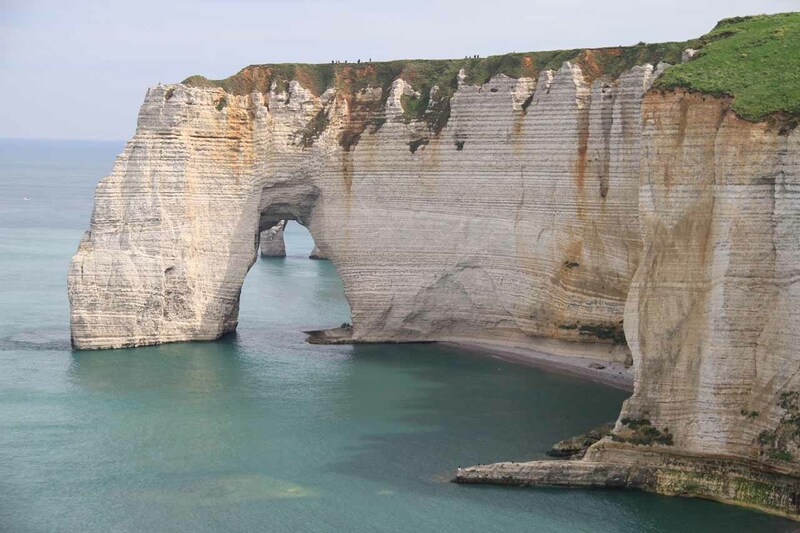 Looking in the other direction (west), I saw the impressive Falaise d’Aval, which was undoubtedly the more attractive of the two arches. 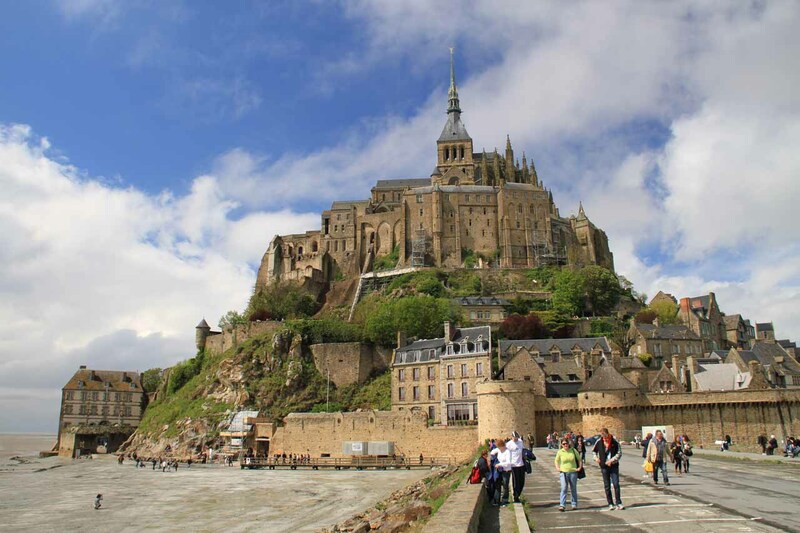 I was able to take the boardwalk approaching the stairs in the direction of Falaise d’Aval, but there were a few areas where it was possible to leave the boardwalk and get onto the pebble beach. 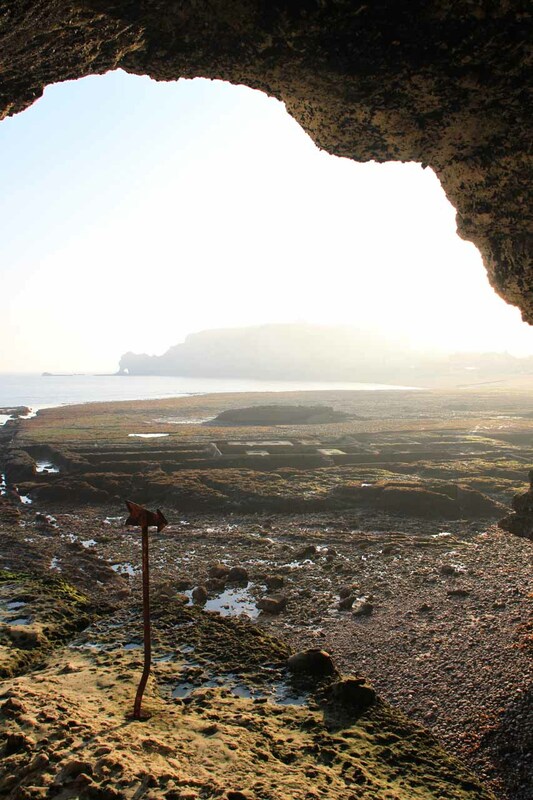 I then scrambled along the pebble beach for a few minutes until I reached a pretty large cave-like alcove. 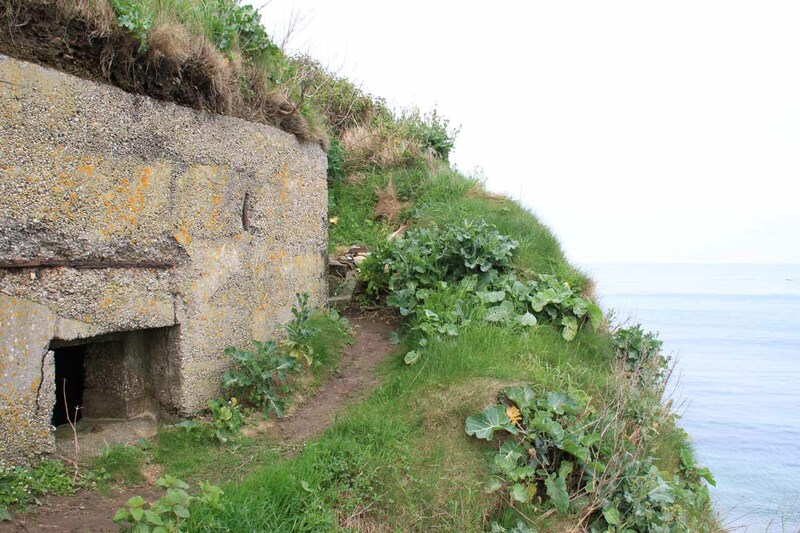 Along the way, I noticed some remnants of bunkers that were set up during war times (probably from World War II). 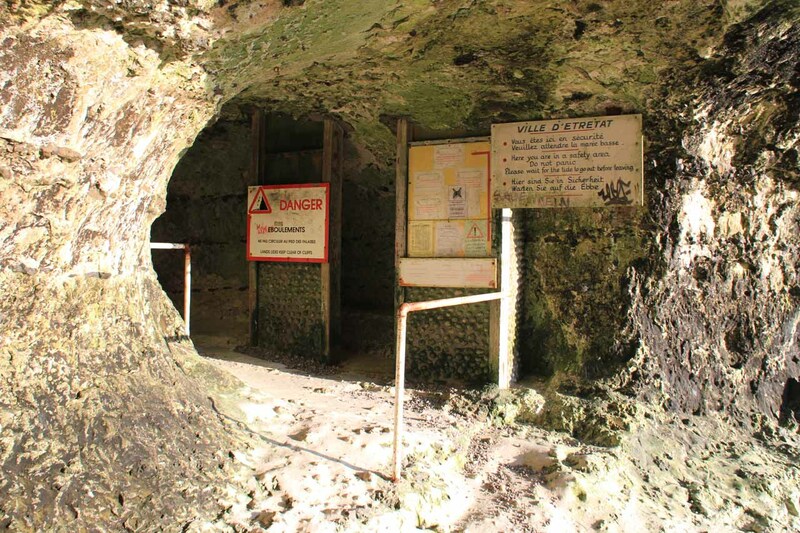 Inside the alcove, there was a rusted metal ladder that I was able to climb up and get onto a ledge that provided access to a tunnel flanked by warning signs. If low tide happened to be during the day, then a torch or flashlight wouldn’t be necessary. 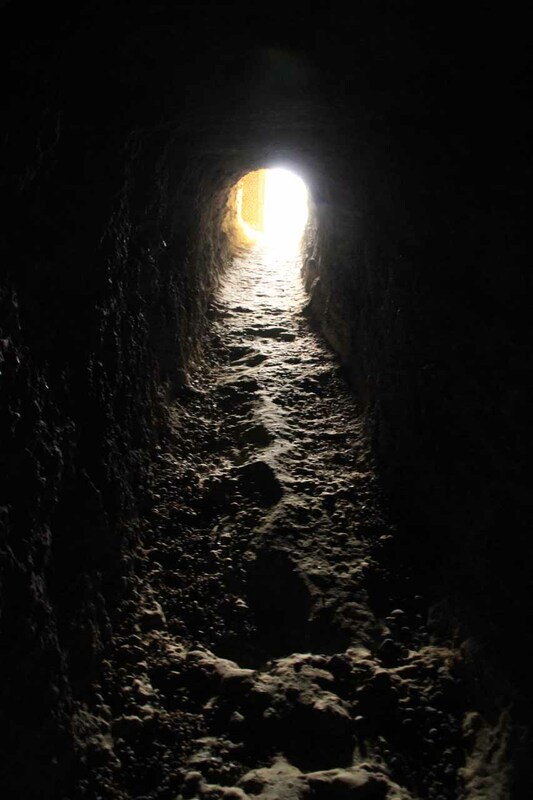 However, since I was here in the pre-dawn hours, I had to use my headlamp to get through the darkness of the tunnel. 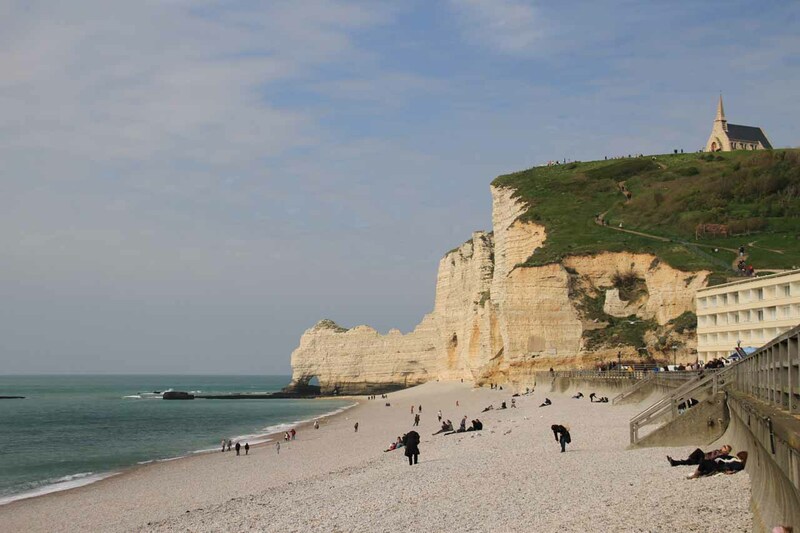 Once I emerged on the other side of the tunnel, I descended onto a stretch of pebble beach sandwiched between the protruding cliffs harboring the arches of Falaise d’Aval and Manneporte. 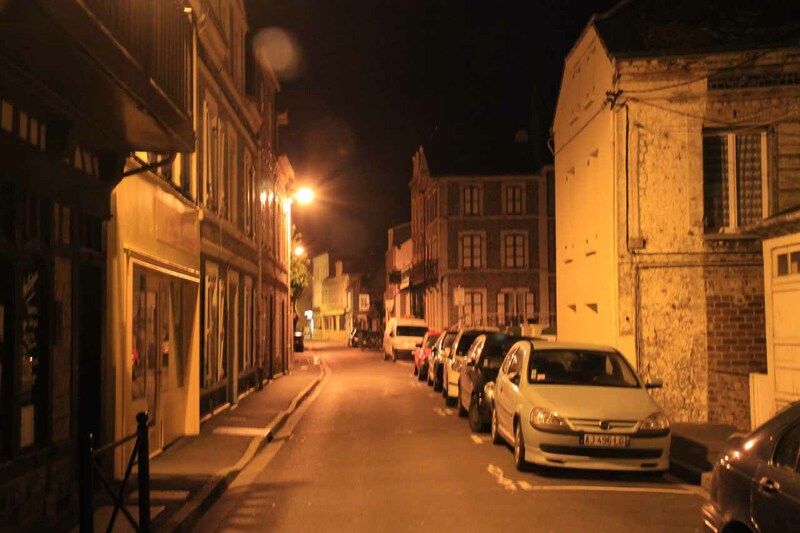 It was this stretch where I first laid eyes on the impressive Manneporte. 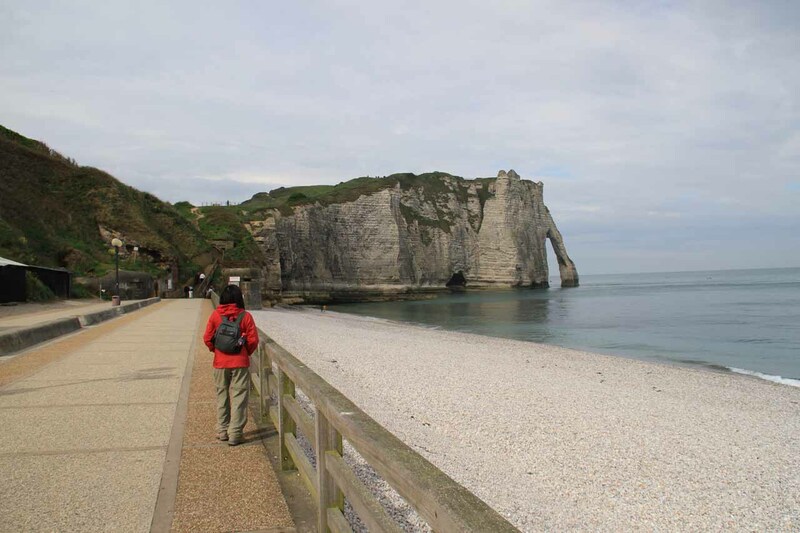 It was possible to scramble (albeit very carefully) towards the base of Falaise d’Aval, but to continue with the hike, I followed the pebble beach towards the span of Manneporte. Once I was close to the arch, there were a few handrails aiding me in getting right into the arch’s span. 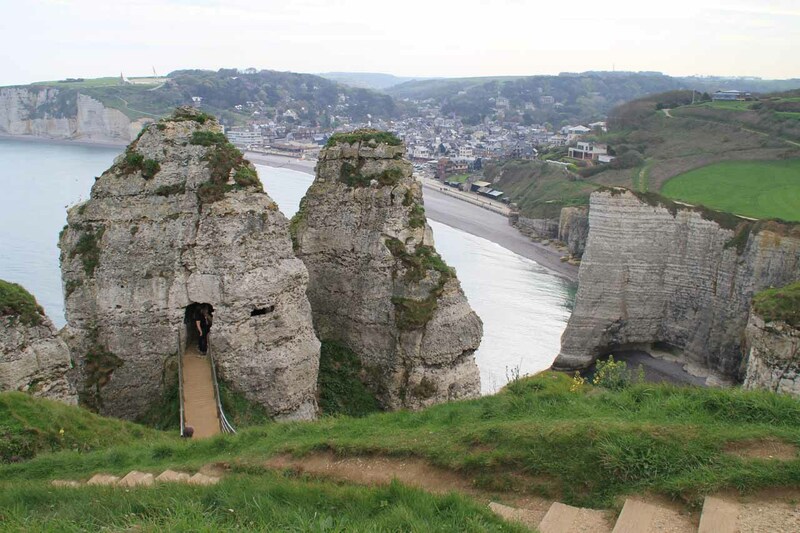 With a wide angle lens, it was possible to photograph Falaise d’Aval through the span of Manneporte (see one of the Pinterest photos below). 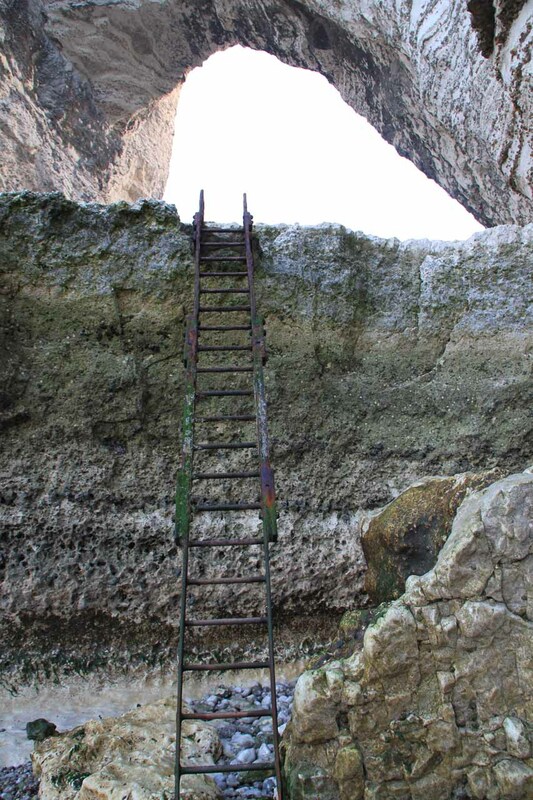 Beyond the arch’s span, there was another metal ladder descending onto small sheltered pebble beach. 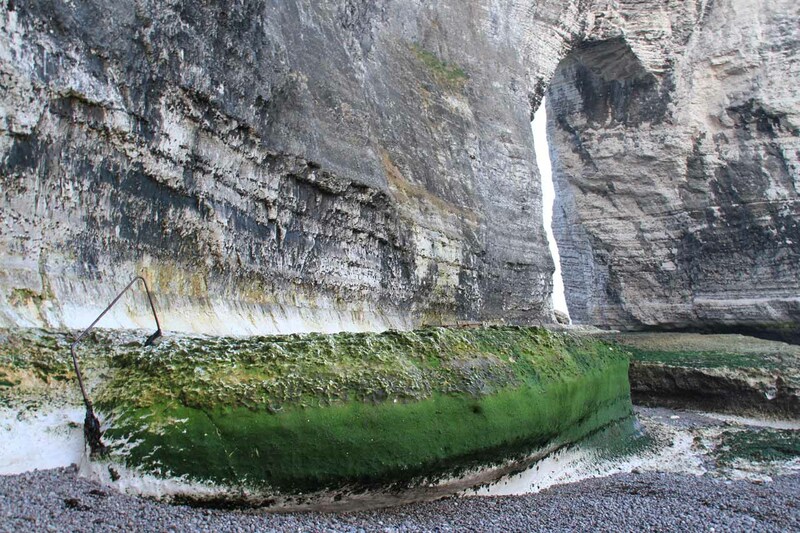 There was a tiny trickling spring (which I had mistaken as the targeted waterfall) with algae growing around it indicating that this part of the cliffs typically saw plenty of moisture. Near this spring, there was another tricky partial ladder to get onto another bench. Getting onto this bench and past its protrusion towards the next stretch of pebble beach would’ve led to the desired waterfall. Unfortunately, I was very conservative about the slip-and-fall hazards on this last obstacle and turned back prematurely. 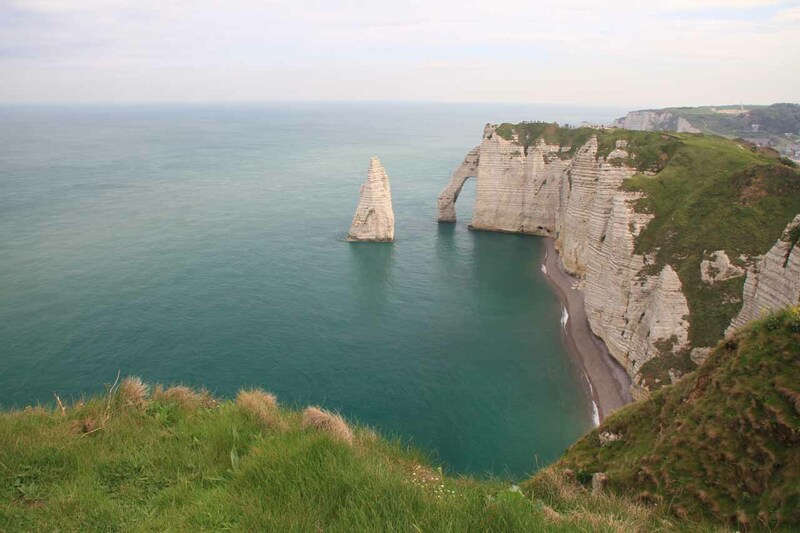 It was only through doing the cliff-top walk later in the day did I realize that I didn’t have that far to go in order to get right up to the waterfall and photograph Manneporte with it! Doh! All things considered, I was able to do the entire walk in about 2.5 hours. This included plenty of distractions and time taken for photographs though I didn’t finish the job. 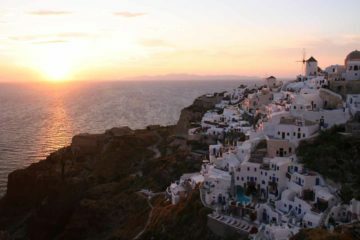 I’m sure I’ll have to come back here one of these days and do it right! 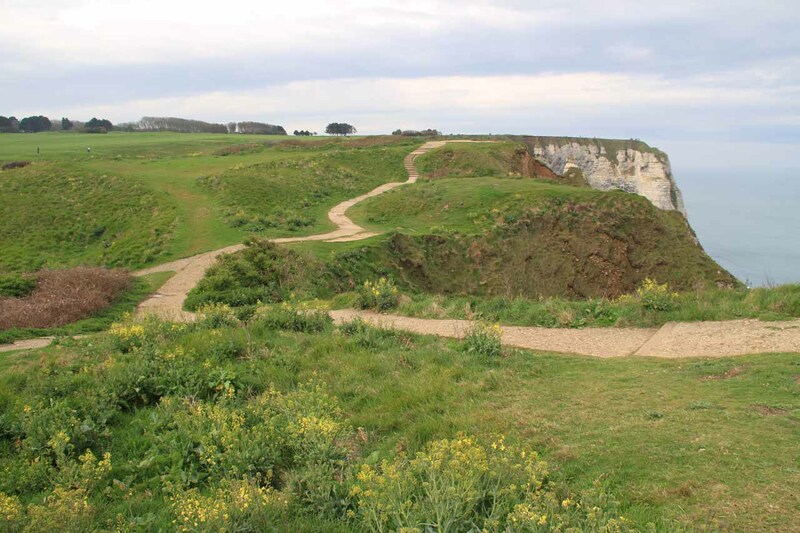 Speaking of the cliff-top walk, it was a much more tame walk where the path was sandwiched between a golf course and the sea cliffs. 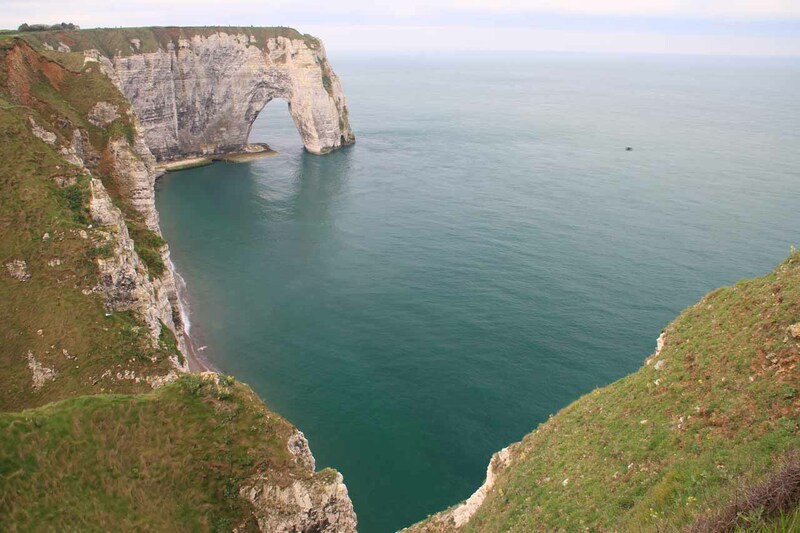 It was possible to see the waterfall from the cliffs once we got to the next protrusion beyond the one responsible for Manneporte. 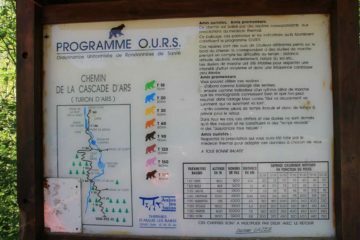 That excursion also took us a relaxed 2.5 hours out and back. 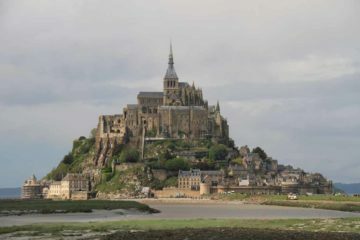 Then again, the benefit of this option was that it was independent of the tides. But as you can see from the photo at the top of this page, the drawback was the rather distant view of the falls. 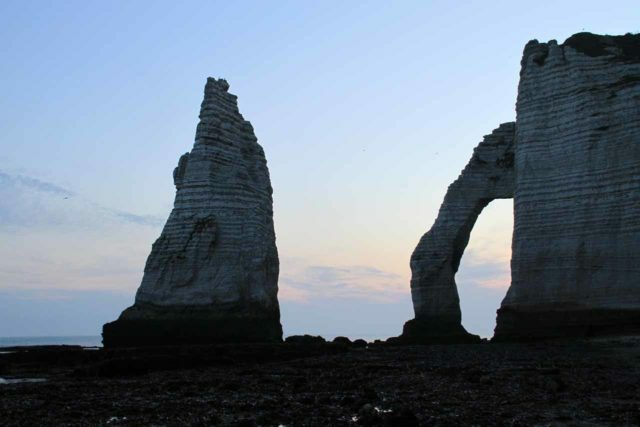 Basically this excursion starts and ends at the town of Etretat, which is about 27km northeast of Le Havre. 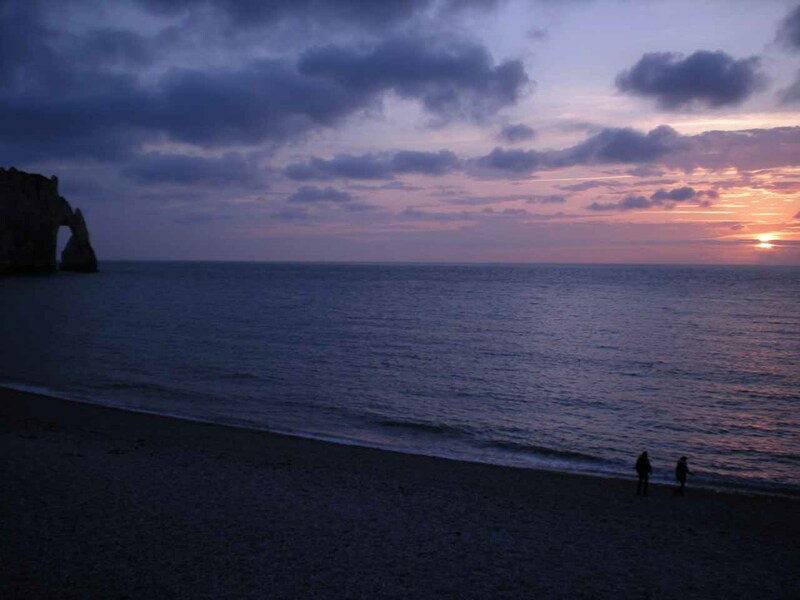 There is some parking near the beach, but there is also free public parking roughly 10 minutes walk from town southeast along the Route D940. 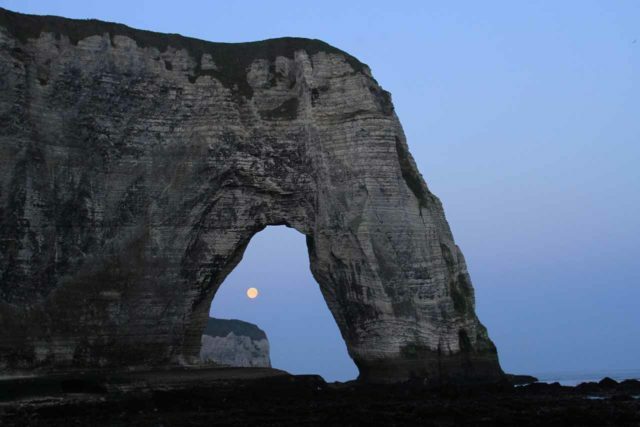 For geographical context, Etretat was 209km (about 2.5-3 hours drive) northwest of Paris. A full moon seen through the span of Manneporte. Are you kidding me?!?! That had to have been one of the most awesome serendipitous events I stumbled upon without even trying!